Many couples that are planning to get married often have the perception that obtaining a marriage license in California is a difficult and time consuming process. They revert back to former years when blood tests and other formalities were part of the progression of planning a wedding. Today, however, it is relatively a simple procedure, and there are several methods you can use to accomplish procurement of the compulsory document that renders your marriage a legal one. In contrast to widely held belief, obtaining a California marriage license can be the least cumbersome thing to deal with in comparison to all the other multitudes of details in need of attention during the event planning process. One effortless method of procuring your license can be as simple as showing up to the designated wedding site on the day of your wedding without any previous preparations and have the minister or officiate provide the document. This approach, though, is dependent upon if the minister is licensed by the State of California as a notary public and authorized by the county to issue marriage licenses. Of course, an additional condition is that the officiate must be willing to provide the service. If so, there are just a few extra uncomplicated conditions to be satisfied. First, both the bride and groom must be at least 18 years of age. The second prerequisite is that if either the bride or groom has been divorced in the past 90 days prior to the wedding date, the final divorce decree must be presented to the notary public who is issuing the license. This is to ensure that the marriage has actually been terminated and the divorce is conclusive. Additionally, current pictured identification must be presented at the time of issuance. 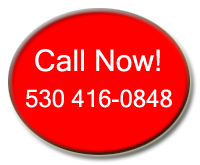 This can be a driver’s license, passport, or other state issued identification. Lastly, you must supply personal information, including your parents’ names and birthplace. Another painless method to get the necessary certificate is to go to any county clerk’s office located within California. Similar to acquiring the credential at the wedding site, the divorce decree must be presented if dissolution occurred within 90 days of the event, appropriate ID must be displayed, and personal information is essential. Too, the bride and groom must concurrently be present before the clerk. 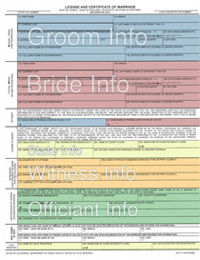 If you choose to acquire the marriage license at the clerk’s office, the clerk will present two types from which you can choose. 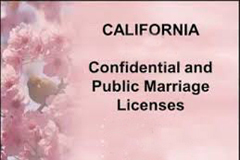 Whereas a California minister is limited to issuing a confidential license only, the clerk will offer a second option, a public marriage license. Although the differences between the two optional forms, confidential versus public, are comparatively subtle, there may be explicit reasons that are significant to a particular bride and groom that would be cause for them to select one over the other. Brief research will help you decide. Regardless of where or by who the legal document is obtained, securing it is not an arduous procedure. Determining which type of California marriage license is best for you, confidential or public, would probably be the only part of the process that might require a little thought. The old days of blood tests and other constraints that were once in existence are now in the past, allowing you a little extra time to focus on the many other aspects of event planning. If you need additional detailed information about California or Nevada marriage licenses, read the supplement article on our blog.